Dan's been on vacation this week. The weather has been absolutely beautiful and as planned, we are working on fencing our other field. Here is our progress in pictures. All of the corner and bracing posts are in the ground. 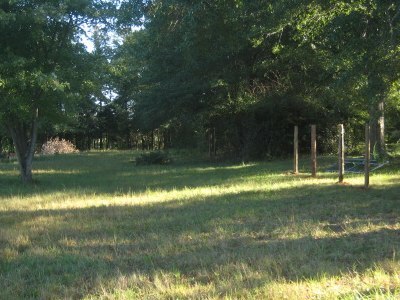 The photo above is looking toward the back of the field. Our house is on the right. Bracing the corners and long sections of a fence give it strength. There are several ways to brace a fence, so what you see in these photos is just one way of doing it. The three posts you see above will be a corner bracing assembly. We will attach the fence to the corner of the shed in the background. The animals will have access through the gate you see back there. They will be directed to this field with portable cattle panels, to make a corridor from the shed to the gate. Above is the north property line I cleared a path for in this post. The length of this section is a little over 300 feet. The three posts you see above will make a double H brace. An H brace is a horizontal brace. The horizontal beam is called the cross member. The full assembly includes diagonally run 9 gauge wires. The direction of the wire is determined by the direction of the pull on the fence. Since this brace is set in the center of a fence line, Dan put diagonal wires in both directions. We use twitches (sticks) to tighten the wires, though there are nifty gadget just for this purpose. Our twitches are leftover flooring from the dining room. It's amazing how well this tightens up the entire brace assembly. From this angle it probably doesn't look like an 8 foot gap between the pairs of H braces. A gate will go here, giving us drive-in access to the field. 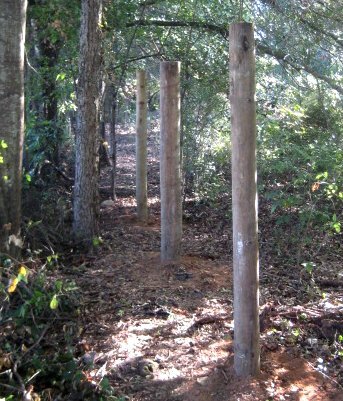 Some of the t-posts are in. 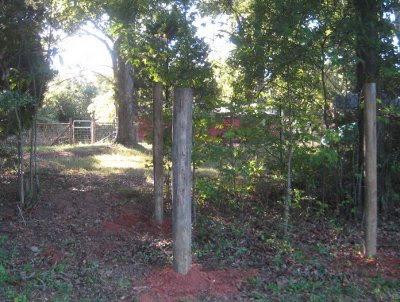 After they're all up, the fence is stretched along the posts, clipped to the t-posts, and stapled to the corner and brace posts. After that's done, we just have to put in the gates and we're in business. As of this afternoon all the cross members are in and Dan's working on the bracing wire. (I'm baking brownies.) This evening or tomorrow we can start stretching the fence. Will we finish before he has to go back to work? Probably not, but we won't have much left to do. Wow! You are spinning wire together to make a stronger fence. The tighter the twist, the stringer it is - just like spinning yarn. How cool is that! I just never realized this before. I know a great way to stretch fence, if you have a 4 wd truck. Attach the fence between 2 2 x 4's, bolt (or screw) them together. 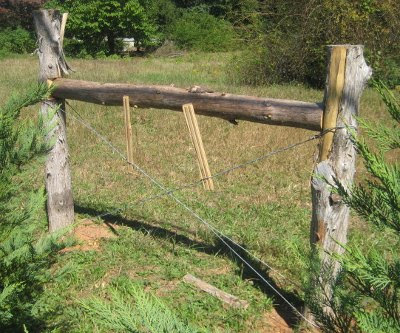 Tie a rope around each end of the 2 x 4, making a loop, and hook the loop over your hitch ball. Put the truck in 4 Low, and in 1st gear (this is critical), idle forward. The fence will "magically" stand up as it tightens. Park the truck and put the clips on to hold it, and then disconnect. 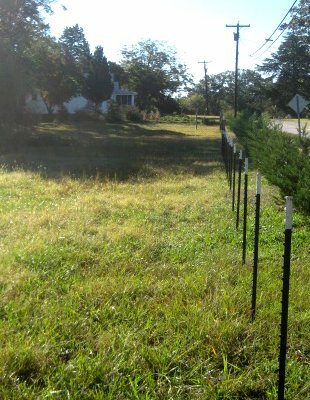 I did a lot of fencing at my place in Reno - my personal best (not to be repeated, I'm sure) was 29 t-posts pounded in in 3 hours. Well done and such a lovely place! Hugs! That was one productive vacation! Way to go. Working vacations! Somehow changes the way one sees "work". Looks great already! Lotta work there; you guys put me to shame! The fence is looking very good...it sure is a lot of work. Having a week of vacation sure helps get the work done! 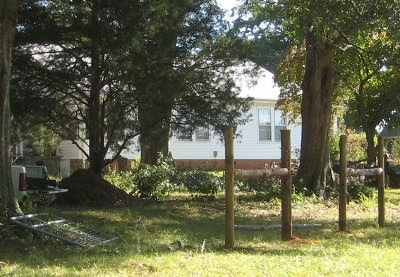 The truck pulling that Laura mentioned is how we bring our fence up. Looking good!! Sure is a lot of hard work but my oh my how good it will feel when its all done!! I think that is the best way to spend a vacation. You two have gotten A LOT of work done on your fencing project! Nice goin'. I don't know what it is about fences and gates but I love 'em. Do they stand for organization? Security? Neatness? Delineation of spaces? Do I need some analysis? Benita, I hadn't thought of it that way either. Funny, as a fiber artist it should have been the first thing to come to mind! Laura, your way sounds so much easier than doing it by hand like we have. Sadly, we don't have a 4WD vehicle. It's a good argument to make the next one 4 wheel drive. Nina, DH especially feels good about it. When he's at work, he feels so non-productive around the place. Evelyn, that's true. Funny how work becomes more fun when it's a vacation choice! Joyce, aw, there's a season for everything including productivity. :) It does make up for all the times we feel like we're just spinning our wheels though. Flower, when it comes to fences, anything easier is usually better! Mama Pea, hee hee, I know what you mean. 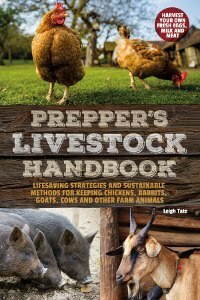 One thing I like about fences is that it means livestock! We love our animals. efforts. Need I say more about the state of our ground here? T posts are such handy dang things, sadly only suitable for the goat fencing. I've seen too many bad horse injuries from metal T posts We had to go wood posts and stretched electric fence/fiber glass for the horses. It all looks great though and the brownies, sound absolutely delicious! The funny thing is: I have a fence problem too!But not as fancy, just an old "snowfence" to be fixed, because it was here when we got the house and I don't want to change and it is good to have a little easy fence against mostly run away animals. Getting cold here to work outside in the morning. Theresa when I first started researching fencing I quickly saw that horses take special fencing. I thought it was bad for goats, but I if it meant injury to my animals, I'd steer clear of t-posts too. Don't horses need higher fence too? Mr H, we're thinking this fence looks better than our first! We've been satisfied with the h braces. 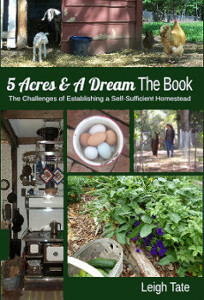 Lee over at Farm Folly has a good, detailed post on building them, here. Julia, I agree, fences are good at keeping unwanted animals out as well as keeping wanted animals in! Katrien, the t-posts are sunk 2 feet, no need for concrete. Our corner posts are deeper. 4 feet is recommended, but ours are 2 and a half to 3 feet deep. No concrete or stones, but we do have clay soil. Fence building is a challenge, but oh so rewarding once it's up!